Most businesses in India will need to GST returns each year to maintain GST compliance. In this article, we look at the list of returns to be filed by various types of businesses under GST along with GST return due date. GST return due dates are provided month-wise for all types of GST returns include GSTR-3B, GSTR 1, GSTR 5 and GSTR 6. As provided in the Tweet above, the due date for filing ITC cliam has also been extended from 20th October to 25th October 2018. The Central Board of Indirect Taxes and Customs, vide notification no. 32/2018 – Central Tax dated 10th August, 2018, has clarified that the Commissioner, after the recommendation of the GST Council, has notified revised due dates for the registered person whose aggregate turnover is more than INR 1.5 Crore and are required to file return in form GSTR – 1 on monthly basis. The revised due dates for filing return in form GSTR – 1 for the period July, 2018 to March, 2019 would be 11th day of the month succeeding such month. The Central Board of Indirect Taxes and Customs, vide notification no. 34/2018 – Central Tax dated 10th August, 2018, has clarified that the Commissioner, after recommendation of the council, has specified that return in form GSTR – 3B for the period July, 2018 to March, 2019 should be furnished on or before the 20th day of the month succeeding such month. The return in form GSTR – 3B is to be furnished electronically through the common portal. It is further clarified, vide notification no. 34/2018 – Central Tax dated 10th August, 2018, that registered person who are required to file the return in form GSTR – 3B can discharge his tax, interest, penalty, fees or any other amount as payable by either debiting the electronic cash or the electronic credit ledger on or before the last day on which the assessee is required to furnished return in form GSTR – 3B. For example Mr. X is required to file return in form GSTR – 3B for the month of August, 2018, then, he can discharge his liability towards tax, interest, penalty, fees or any other amount by 20th September, 2018 i.e. the last date of filing return in form GSTR – 3B for the month of August, 2018. GSTR-3B, GSTR-5, GSTR-6 and GSTR-5A should be filed in May, 2018. Regular taxpayers having GST registration would have to file GSTR-3B return only. GSTR-5 is only applicable for non-resident taxable persons and GSTR-6 is applicable only for Input Service Distributors. April 10th 2018 – GSTR 1 return must be filed by taxpayers having GST registration with an annual turnover of more than Rs.1.5 crores. April 18th 2018 – GSTR 4 return must be filed by taxpayers registered under the GST Composition Scheme. April 20th 2018 – GSTR-3B return must be filed by all taxpayers who have a GST registration irrespective of turnover. April 20th 2018 – GSTR-5 return must be filed by all taxpayers who have a non-resident taxable person GST registration irrespective of turnover. April 20th 2018 – GSTR-5A return must be filed by all taxpayers who have a non-resident taxable person GST registration irrespective of turnover. April 30th 2018 – GSTR 1 return for the quarters of January to March 2018 must be filed by taxpayers having GST registration with a turnover of less than Rs.1.5 crores. GST Returns can be filed online through the GST Common Portal or an online GST accounting software. The proposed GST regime is backed by a technology platform maintained by the GSTN. GSTN has provided GSP Licenses for enabling businesses to file GST returns through various types of accounting software and ERP systems. Hence, GST return can be filed directly on the GST Common Portal or through a GST accounting software with the requisite features. 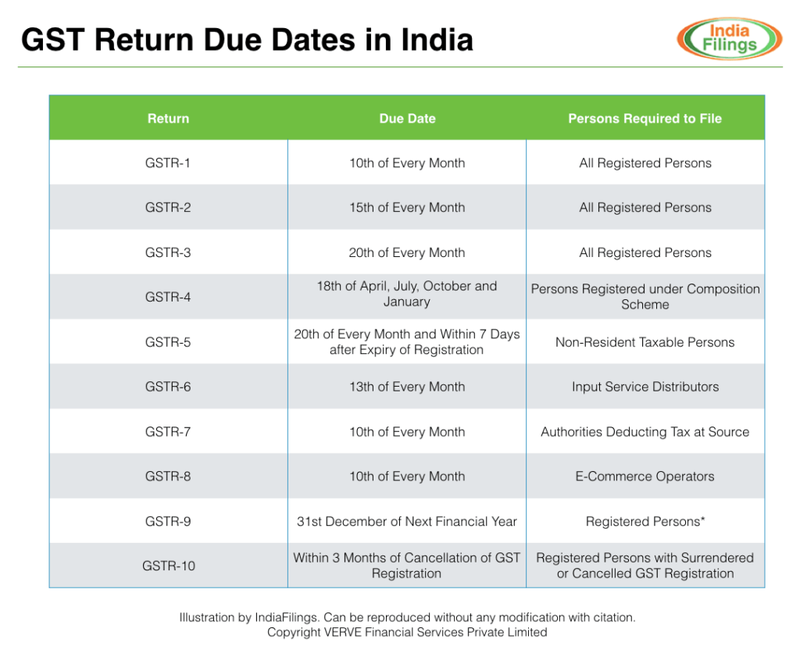 When to File GST Returns? Under GST, a regular taxpayer needs to furnish three monthly returns and one annual return. If a taxpayer is registered under the composition scheme or is a non-resident taxpayer or is a taxpayer registered as an Input Service Distributor, or a person liable to collect TDS or TCS or was granted UIN, then they would have to file other forms. 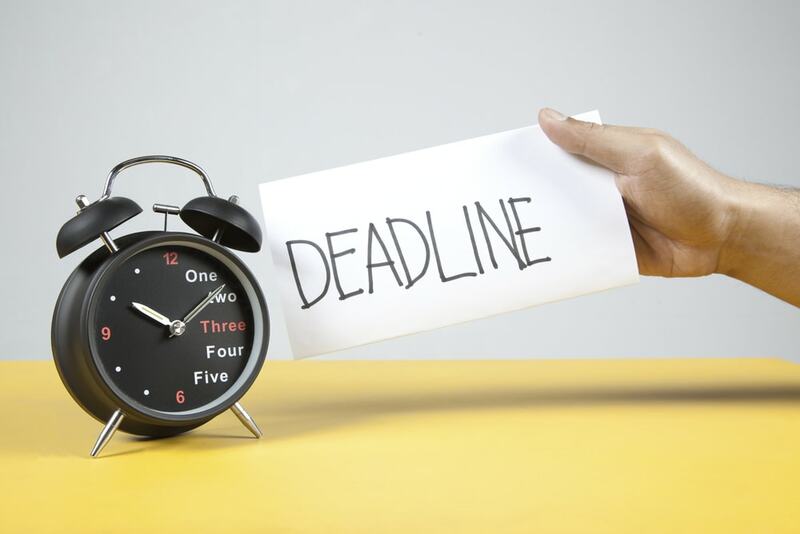 Any taxable person under GST who fails to file form GSTR 3B, GSTR-1, GSTR-2, GSTR-3 or Final Return within the due dates, will be fined a late fee of Rs. 50 per day. In case of NIL return, the penalty will be Rs.20 per day. GSTR-3B return must be filed by all persons having GST registration. GSTR-3B return is due on the 20th of each month. GSTR-1 Return or the statement of outward supplies is used to file details of all supplies made by a taxpayer in the previous month and record the tax liability of the supplier. GSTR-1 must be filed on or before the 10th of every month with details of all supplies effected during the previous month. GSTR-2 or the statement of inward supplies is used to file and verify details of input tax credit accrual received during the previous month. GSTR-2 details are auto-populated from the information filed in GSTR-1. Hence, in the statement of inward supplies, the taxpayer must only provide minimal additional information like imports, and purchases from unregistered suppliers. GSTR-2 must be filed on or before the 15th of every month with details of all supplies received during the previous month. Note: GSTR 2 has been put on hold until further notice. Note: GSTR 3 has been put on hold until further notice. GSTR-9 or Annual GST return must be filed by 31st December of the next financial year by all taxable persons registered under GST. Information provided in GSTR-4 would include details of expenditure and details of income for the entire financial year. The GST Annual Return must be audited by a practising Chartered Accountant if the aggregate turnover of the registered person exceeded Rs. 2 crores during a financial year. Further, along with the GST annual return, a copy of audited annual accounts and a reconciliation statement, duly certified by a Chartered Accountant, in FORM GSTR-9C, must be filed electronically through the GST Common Portal. The GST Composition Scheme is designed to reduce the tax compliance burden for small businesses having an annual turnover of less than Rs.150 lakhs and doing sales only within the state. Taxable persons registered under the GST Composition Scheme are required to file quarterly GST returns and GST annual return. GSTR-4 must be filed every quarter on the 18th of the month, succeeding the quarter. Hence, GSTR-4 would be due on the 18th of July, 18th of October, 18th of January and 18th of April. A composition supplier is also required to file GST annual return on or before the 31st December of the next financial year. 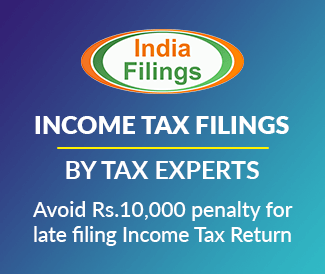 Annual return filed by a Composition Scheme supplier would not have to be audited, as the turnover would not be over Rs.75 lakhs. 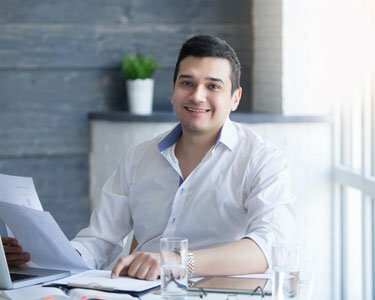 Foreign companies or non-resident taxable under GST are also required to obtain GST registration and file GST returns if they supply goods or services to persons located in India. All foreign companies or non-resident taxable persons are required to file GSTR-5 on the 20th of every month and within 7 days of the expiry of GST registration. Non-resident taxable persons are required to file GSTR-5 with details of all outward supplies and inward supplies through the GST Common Portal. Based on the filing, the taxpayer is required to pay the tax, interest, penalty, fees or any other amount payable under the GST Act before 20th of every month or with 7 days of the expiry of GST registration, whichever is earlier. If the non-resident taxable person is involved in providing online information and data base access or retrieval (OIDAR) services from a place outside India to a person in India, then GSTR-5A form must be filed before the 20th of every month instead of GSTR-5. Non-resident taxable person under GST are not required file GSTR-9 which is the GST annual return. E-commerce operators are taxable person under GST who own, operate or manage digital or electronic facility or platform for electronic commerce. Electronic commerce operators are required to collect tax at source and file FORM GSTR-8 before the 10th of the next month. Hence, even if an electronic commerce operator is acting only as a marketplace, they must provide details of all supplies effected through them and the amount of tax collected. The details provided by electronic commerce operators would be made available electronically to all suppliers while filing Form GSTR-2 on the GST Common Portal, after the due date of filing of FORM GSTR-8. If an electronic commerce operator is involved in the supply of any taxable goods or services, the electronic commerce provider would be required to file regular month GST returns like GSTR-1, GSTR-2, GSTR-3. All person classified as an Input Service Distributor under GST is required to file FORM GSTR-6 on or before the 13th of each month. Details of tax invoices on which credit has been received would be made available to Input Service Distributors on FORM GSTR-6A and the input service distributor can if required, after adding, correcting or deleting the details, file the GST return electronically. Any authority deducting tax at source is required to file Form GSTR-7, on or before the 10th of every month. On the basis of the GSTR-7 return filed by authorities required to deduct tax at source, details of the transaction would be made available electronically to suppliers in FORM GSTR-2A and FORM-GSTR-4A. GST Final Return must be filed by all taxable persons who were registered under GST and their registration was surrendered or cancelled. GST Final Return or GSTR-10 must be filed within three months of the date of cancellation or date of the order of cancellation, whichever is later.